Do a favor for the Jarl of Dawnstar by killing a giant. Kill a giant for the Jarl of Dawnstar. This is a radiant quest which is received from Skald, if he is currently the Jarl of Dawnstar. The giant camp is randomly determined from the following list: Blizzard Rest, Red Road Pass, Tumble Arch Pass. Speak with Skald, the Jarl of Dawnstar. Kill the giant at the given camp. Return to retrieve the bounty. 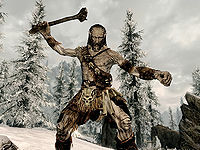 The Jarl of Dawnstar, Skald, will ask you to deal with a giant to send a message to all the other giants in the hold, for although they are not a problem now, the jarl believes they will be in the future. The giant can be found at one of three camps (above) and can be taken down by any means necessary. Completing this quest is required to start the Thane of the Pale quest and purchase land in DawnstarHF if Skald is still Jarl. This quest requires a giant to kill. If you have cleared all of the giants from all of the giant camps, then you cannot receive this quest from Skald. To solve this issue, wait or sleep indoors for 30 days and all giant camps will have been respawned. Sometimes the quest objective will not be removed from the journal. On the PC, it is possible to use the console to advance through the quest by entering setstage Favor153 stage, where stage is the number of the stage you wish to complete. It is not possible to un-complete (i.e. go back) quest stages, but it is possible to clear all stages of the quest using resetquest Favor153. This page was last modified on 26 February 2017, at 19:18.